According to Jon Gordon, author of "Soup: A Recipe to Nourish Your Team and Culture," “Employees are in a funk. They are fearful, overworked, distrustful, and have less enthusiasm and passion than ever. And, many leaders are continually frustrated by their team's performance and low employee morale and engagement. "The answer," says Gordon, "doesn't involve fancy technology, a new piece of equipment, or extensive R&D. In fact, the answer lies in a basic human emotion: motivation. Leaders who motivate do. Now, more than ever, a leader's job is to motivate and rally his or her team through challenging times. You can't outsource motivation. It is the leaders and managers who must motivate." "Most business leaders want to take the emotion out of business," he says, "but that is a huge mistake. When fear and negativity are the primary emotions people in your organization are feeling, you have to counter that with an even more powerful emotion, like faith, belief, and optimism. And your success in that depends on your ability to motivate." Jon Gordon participated in an interview to flesh out important ideas about management and motivation and the roles of culture, communication, vision, emotion, and relationships in inspiring motivation. Susan Heathfield: All of the readers have an opinion and a picture in their minds when they hear words such as employee motivation and employee engagement. Define what you mean when you refer to employee motivation and employee engagement so that we are all starting together with a shared picture. Jon Gordon: Employee motivation is based on the culture management creates and what the leader or manager says and does to help employees perform at their highest level. The goal is to motivate employees with the right environment and management practices that bring out the best in employees so they can give their best to the organization and customers. Employee engagement is how committed, excited, energized and passionate you are about the work you are doing and the organization you are working for. Heathfield: As the number of unemployed workers has reached an all-time high, employees are wary about job searching and changing employment. Many believe that they are better off where they are–with a job–than walking among the ranks of the unemployed. The site readers’ favorite recent article, however, was "5 More Reasons to Quit Your Job," so, under the circumstances, there must be a pent-up interest in moving on from current employers. Knowing this, how would you advise managers to create an environment in which employees want to stay and are motivated to work hard, contribute, and continue to develop their talents and skills with their current employer? Gordon: It makes a lot of sense. People aren’t quitting because they want security, not because leaders and managers are building winning teams. The solution is to create what I call a culture of greatness–a culture in which you focus on creating a culture that values, cares for, and develops their employees. The key is to create engaged relationships with your employees. I write a lot about this in my book "Soup." Focus on investing in people: training them, mentoring them, appreciating them, recognizing them, encouraging them, coaching them and caring about them. Very simple objectives, but too many organizations and managers don’t do them. Gordon: The key is to share the vision of the organization and then talk to each employee and have each employee understand how they contribute to this vision. The vision can’t exist on a piece of paper. It must come to life in the hearts and the minds of the people who work in your organization. Gordon: Expect the best from the employees. You can settle for nothing less than excellence. But you also help each person achieve excellence. You help each employee be their best. You create the culture that is motivating, exciting and flexible and then you give employees room to grow in this culture. Don’t micromanage. Trust them. Develop relationships with them. Give them opportunities to share ideas, and contribute and they will. Also, give them room to make mistakes. Nothing drains an organization’s energy more than fear of failure. Heathfield: What are the specific actions that management can take on a daily basis to create a motivating environment for employees? Gordon: The actions management can take are so simple and full of common sense and yet they are uncommonly practiced… The actions include smile more at employees. Listen to them, their ideas and solutions. Earn trust by saying what you will do and doing what you say. Appreciate them with a sincere “thank you”. Companies spend billions on recognition programs and what people really want is “thank you”. Coach them so they know that you care about them. Invest in them so they know that you are concerned about their growth and future. And, do the little things to show them you care: An encouraging word, a listening ear. If you don’t treat them like a number, they won’t treat you or your customers like a number. Arguably, management's ability to create an environment in which employees choose motivation is the key management role for the success of your organization. 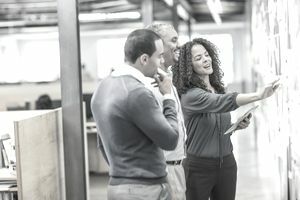 Other roles, such as managing change, hiring talented employees, and setting measurable goals, are enhanced by management's ability to inspire motivation and contribution from employees. Motivation matters, to management, to employees, and to your organization.